What is no-fault auto insurance? What are the no-fault insurance laws in New York State? Below, we explain what no-fault means and how it applies to all drivers in New York. New York became a no-fault insurance state in the 1970s when the No-Fault Law was enacted. This law aimed to protect drivers by ensuring that insurance companies would cover the cost of damages associated with legitimate car accidents. Under this law, car insurance providers reimburse those that they insure no matter who is responsible for an accident. 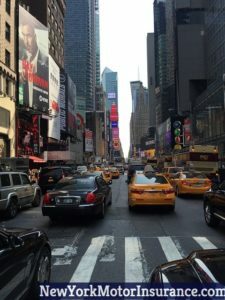 The purpose of the New York’s no-fault law is to expedite the compensation those who are injured in a car accident receive by preventing them from having to dispute who was at fault. Damages include medical bills, lost wages, and other expenses that are related to medical needs that occur because of a vehicle accident. Every insured vehicle in the state of New York has a minimum of $50,000 in no-fault coverage for every person who occupies the insured vehicle. Should an accident occur, no-fault insurance will cover 80 percent of the gross wages that an individual loses as a result of an accident, the maximum amount being $2,000 a month; the 20 percent that isn’t covered is intended to replicate taxes. As such, no-fault payments aren’t taxable. Any medical supplies that are needed as a result of an accident-related injury, such as a wheelchair, a walker, or crutches, as well as the cost of driving to and from doctors’ appointments may also be covered. Additionally, if you are unable to perform certain chores while you are injured and have to pay someone else to do them, you may also be reimbursed for these payments. Who is Eligible for New York’s No-Fault Insurance Benefits? The insurance policy has to be sold in the state of New York or at least issued by an insurance company that is licensed to conduct business within the state. The vehicle has to be a car, a bus, a taxi, or a truck. Only drivers or passengers of the vehicle that is insured are covered, as are pedestrians and bicyclists that are bit by an insured vehicle. The person who was injured must be either a driver or a passenger of an insured vehicle, or a pedestrian or bicyclist that was hit by an insured vehicle. The insured vehicle must be registered in the state. Who is Not Eligible for New York’s No-Fault Auto Insurance? Those who have insurance policies that were not purchased within the state of New York or who have a policy from a company that is not licensed to conduct business within the state. Drivers who were involved in and injured by a car accident while operating the vehicle under the influence of drugs or alcohol. There are several steps that must be followed when filing a no-fault insurance claim. Though the purpose of the no-fault law was to ease the burden of those who are injured in motor vehicle accidents and expedite the money they receive for medical needs, there have been several incidents of insurance fraud. Complete the no-fault application. You will receive a no-fault application (an NF-2 form) from your insurance carrier, but you can also request one. File the application. Make sure you complete and file the application within 30 days of the date that the accident occurred. Failure to miss the deadline will make your application null and void. Send to the right insurance company. Additionally, ensure that you send the no-fault application to the right insurance company. The application should be sent to the insurance company of the car that you were either struck by, of the car that you were driving, or of the vehicle that you were a passenger in. In addition to filing the no-fault claim within the allotted time period, you must also make sure that you submit medical bills in a timely manner, as well as lost wages. Medical bills must be submitted within 45 days of treatment and lost wages have to be submitted within a 90 day period.